88. Superman: King of the World-never read it. I read the triangle era pretty faithfully, but stopped when the Red Superman/Blue Superman stories hit and have never read Superman regularly since. I might actually try the Bendis stuff though. 88. Golden Age-good stuff. Robinson and Smith were at the top of their games. It's one series I have hung on to through multiple purges of comics, which says something for my affection for it. 88. 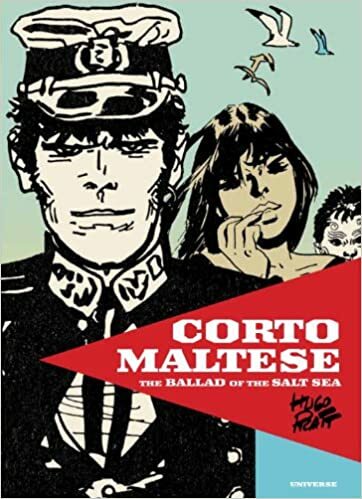 Corto Maltese: Ballad of the Salty Sea-read this after Shax brought it up at the old place and quite liked it. It's a masterful work of comics storytelling. I have been slowly tracking down the IDW Corto Maltese volumes but haven't gotten around to reading them yet. 88. Bram Stoker's Dracula-looks magnificent, but I have only managed to track down 3 of the 4 issues, so haven't read it yet. 86. Maus-a masterpiece. I lent out my copy and never got it back, so haven't revisited it in a while, but I need to get another copy and remedy that sometime soon. 81. Pluto-not read, though I have seen panels/excerpts in a couple of books about comics. I haven't read much stuff from Japan though. 81. League of Extraordinary Gentleman-another volume I lent out and never got back so its been a decade or more since I revisited it. I need to. 81. Box Office Poison-I've seen this several times on the shelves and our local library had a copy (since lost) but I never got around to giving it a try. 81. American Flagg!-I have been putting a run together of this slowly over the last couple of year and need only 1 issue (ironically it's #1) to complete the run. I read a handful of issues when I started sampling stuff from First in the 80s (sometime after I read Chaykin's Shadow mini) but I didn't stick with it (Chaykin had mostly handed off the book by that point) but I always wanted to get around to checking out the early stuff, just never got around to it. Missed it in the day and haven't read because keep meaning to pick it up but haven't yet. Dagnabbit! Never heard of or read. Read one. Poor translation so haven't really pursued since. Maybe time to try again? Read: Nope, but looks cool. I'm poorly read on adaptations from other media in general. Read and enjoyed. Really great run. 81 (tie). The League of Extraordinary Gentlemen, Vol. 1.
Who hasn't read some Raymond Flash Gordon in one form or another? On my shopping list! Read it in the day but not since. Chaykin's last great hurrah possibly as writer/artist. Hell of a concept and while the art captures and fits the world it also doesn't do it justice in some ways?!? Can we get this James Robinson back ? I've only read bits and pieces of Starman but want to get the entire series later. Big Earth-2 fan and I loved this, especially with the pitch perfect Paul Smith art. Why can't we get more from him too ? I vaguely know Lewis Trondheim though I haven't read any of his work yet. Just picked up an autobiographical graphic novel he wrote of breaking into the big time. Not familiar with this but am glad to know about it. I have some Corto Maltese. I know enough to say it's place is well deserved on this list. Hugo Pratt is up there with Will Eisner IMO. Not the biggest horror fan, but this is definitely an exception. Practically perfect IMO. Crazy about Maus. Spiegelman up until this point was just ok as an underground artist but this powerful biographical about his own family is legendary with good reason. Loaned it out never to see it again. Have since gotten a new copy, plus the sequel, in a set with a dvd and commentary. Looking forward to getting my sister, who has never read a comic but loves Schindler's List, to try this. Alan Moore, despite his grumblings, is still one of my favorite comic writers. This is great fun and O'Neill is well suited to the material. Legendary strip by the equally legendary Alex Raymond. Have only read snippets here and there, but this is another I need to collect. Read it. It was ok.
My vote. One of the first titles that really advanced the medium back then of not holding your hand and spoon feeding you everything. Made you think and re-read it to get all the connections for maximum absorption. Still one of Chaykin's strongest works. Honestly, this sounds like a nightmare, and probably what would actually happen if Supes was real. I really need to get this,always regretted having missed it. Shax mate, Ive tried,numerous times, because of you, to read these, and while they are enjoyable adventures I really dont get the outpourings of love. Now Im happy to admit that is probably more my intellectual failings than yours, but it is what it is. These made buying some rubbish reprintbooksin the 70's worthwhile, all by theyself. Fromthe VERY little Ive seen I adore these. By the Gods can you imagine if Raymond and company were working today. Flagg, like Sable was such a breath of air in the 80's, and was this the first book where the lettering became an integral part of the storytelling, maybe this and Cerebus. The first Corto Maltese adventure still feels very different from those that followed in that it weaves one seamless story as opposed to a variety of episodic adventures, and that story is full of depth and meaning to an extent that I did not find in the immediate sequels upon a first reading. I'm hoping I'll appreciate them more the second time around. The magic with Pratt is his sense of understatement. The most important elements of this story, in terms of characterization, motives, and (most importantly) symbolism, are muted and rarely paraded on panel for the convenience of the reader. Even key plot points and the passage of time itself become obscured and dream-like at times. Much as with the sea for which the story is named, Ballad is reluctant to spell out its secrets for the sake of the viewer. The same burning frustration Corto feels when looking out at the ocean and wondering if he doesn't have it all wrong pervades the telling of this story and challenges us to look deep. And, of course, as this is Pratt's first outing, the story matures as it goes, the early volumes trying far too hard to introduce action sequences that aren't warranted once every twenty pages. Once those subside, the flight of those damn gulls and the heavy silences that accompany them are far more striking than the fists that swing and the guns that fire. I love this book almost as much as I did reading it the first two times. The only difference now being that I feel I've uncovered too many of its secrets, and the sense of wonder has begun to leave as a result. If they don't help, then I guess it just isn't for everyone. Too bad. I wish it could bring everyone the joy it brings me.